The FileVault window appears when you choose Security under System Preferences. As an administrator, you can set up a safety net master password for your system, which you’ll need to unlock FileVault. You can use this computer-wide password to bail out authorized users on your system who forget their passwords. And if you run a small business through your Mac and have to fire an employee, you’ll be able to recover any data left behind in that person’s account. Heed Apple’s warning: If you forget your login password and master password, your scrambled data may as well be toast. If FileVault is turned on and you’re not logged in to the machine, other people you normally share folders with on the computer will not be able to access those folders. FileVault can also exact an extreme performance hit on home directories with, say, large iPhoto or iTunes libraries — it can take a long time to decrypt files when you log in and scramble them again when you log out. So while FileVault is a wonderful tool for confidential stuff, be aware of the potentially harsh consequences if you have little to hide. One way around this issue is to set up a specific account with your confidential information and FileVault it. 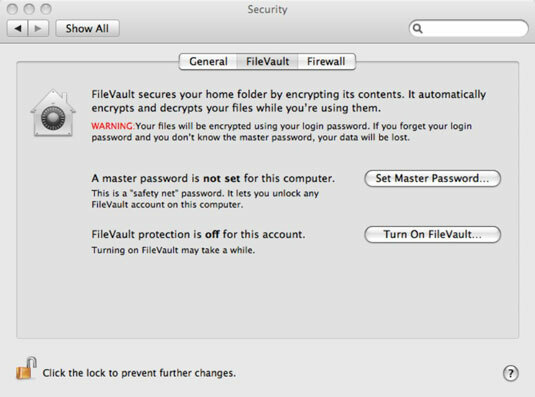 FileVault automatically applies the level of encryption employed by Uncle Sam. It’s what nerds refer to as AES-128 (for Advanced Encryption Standard with 128-bit keys) — and it’s really secure. Apple claims it would take a machine approximately 149 trillion years to crack the code.